This is the first full account of Jonas Salk’s (1914-1995) life ever published. The author is Charlotte Jacobs, M.D. a professor of medicine (Emeritus) at Sanford University. Later in life she studied biography writing; this is her second biography she has published. I recently read “American Biography,” by Carl Rollyson so I paid closer attention to the details required to make a great biography while reading this book. I felt Jacobs followed the requirements when she researched and wrote the book on Salk. 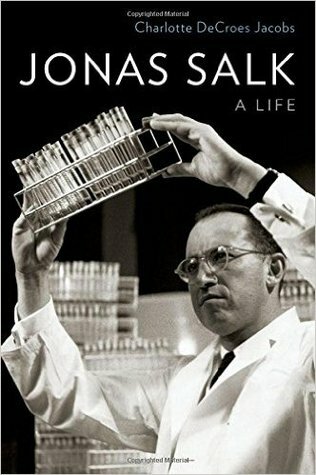 This is an excellent biography of Jonas Salk the man.The book is well written, the writing style is engaging and informative. The writing did not appear to be heavily academic. Jacobs wrote a sympathetic narrative but did reveal the strengths and weakness of Jonas Salk from his extreme shyness to his idealism. Dr. Jacobs had unprecedented access to Salk’s sealed archives and she conducted hundreds of personal interviews. The research appeared to be meticulous. The author does a good job revealing how the scientific community treated Salk and also how Salk was affected by anti-Semitism early in his life. Salk attended New York University School of Medicine at it did not discriminate against Jews as all the Ivy League school did. Salk’s parents were Jewish immigrants from Poland.On 12 April 2015 marked the sixtieth anniversary of the announcement that Jonas Salk’s vaccine could prevent poliomyelitis. I remember the excitement of polio being conquered; I also remember lining up at school to get the vaccine. Salk was a professor of medicine at University of Pittsburgh School of Medicine and later developed the Salk Institute. Salk did not patent the Polio vaccine and received no monies from it. Besides his work on polio Salk did pioneering work on multiple sclerosis and AIDS; he was also the co-developer of the first influenza vaccine with Thomas Francis M.D. The Salk vaccine is still used today along with the Sabin vaccine, together they are more effective against polio. I was amazed to discover that Jonas Salk did not receive the Nobel Prize in Medicine for discovering the vaccine for Polio. I remember my mother’s fear every summer and all the precautions she took to keep my sister and I safe from polio. The discovery was truly one of the greatness in the 20th century. I read this as an audiobook downloaded from Audible. Pam Ward did a good job narrating the biography. This is a fairly long book at about 20 hours. I am looking forward to reading more books by Charlotte Jacobs. No one born after about 1950 is likely to have any living memory of the abject fear that seized hold of the American psyche under the annual threat of polio. But I remember.Early in the 1950s, as polio steadily grew more prevalent with every succeeding summer, I grew from childhood into adolescence, prime years for susceptibility to what was more properly (though misleadingly) called infantile paralysis. Most of my friends chafed under the near-hysteria of their parents, but my father was a doctor: there was no hysteria in our household. Instead, I was quickly spirited out of town to rural summer camps where polio was rare.Then, with hope rising as a result of increasingly more optimistic field tests beginning in 1953, headlines around the world finally blared in the spring of 1955, “Polio is Defeated!” A young doctor, barely more than forty years old, had developed a safe and effective vaccine with financial support exclusively from what was popularly known as the March of Dimes. (That organization was very different from its successor today, which focuses on premature birth and birth defects.) Salk become an instant global star. In many communities, the celebrations that ensued rivaled those that capped the victories in World War II. The doctor’s now well-known name was Jonas Salk. Now, Charlotte DeCroes Jacobs, both a physician and a biographer, has written what may be the definitive story of the man’s life. It’s an outstanding piece of work, and an eye-opener.The polio wars: Salk vs. SabinSalk’s vaccine, technically a “killed virus vaccine” administered by injection, came into existence only because Salk used an unconventional approach and doggedly persevered in his research despite the loud protestations of other virologists. Most prominent among the chorus of naysayers was Albert Sabin, a rival researcher whose oral “live virus vaccine” against polio came into wide use only in the 1960s. Even after an enormous field test proved Salk’s vaccine to be both safe and effective, Sabin and others continued to insist loudly that a killed virus vaccine was dangerous and should not be administered. This led the FDA to call a temporary halt to the administration of the vaccine. Later, it also came to be reflected in the adoption by the U.S. government of the oral vaccine as the sole option offered in the United States. For a number of years, the Salk variant was no longer even manufactured in the U.S.Nonetheless, from 1955 until 1961, Salk’s vaccine reduced the incidence of polio in the United States by ninety-seven percent. In Sweden and Finland, where it was fully adopted, the vaccine totally eliminated polio. Despite this near-flawless record Sabin and others continued to object to the use of Salk’s formulation. When Sabin’s rival vaccine was put into wide use, dozens of Americans eventually contracted paralytic polio as a result, exactly as Salk had predicted. Only years later, once Salk had perfected a more advanced formulation of the killed virus vaccine, was it offered as an option in the United States.Sabin never acknowledged in any way the damage his vaccine had done, and for the rest of his life continued to undermine Salk in scientific circles, as did a number of other prominent researchers. Though idolized in the press and among the public, Salk was virtually a pariah in the scientific community, at least in part because the press had made him a celebrity. (Clearly, his unpopularity within the scientific establishment was also a result of his insistence on working in his own way, without regard for others’ views.) He was essentially blackballed in the Nobel committee and was never admitted to membership in the prestigious National Academy of Sciences.Influenza, multiple sclerosis, and AIDSPolio was only one of several diseases Jonas Salk investigated. Barely out of medical school, he and his mentor produced the first influenza vaccine in 1938. His search for a cure for MS showed great promise in the eyes of neurologists, who found his contributions significant, but was denigrated by many of the same virologists who seemed to disapprove of everything he did. Unfortunately, that research ended prematurely when his patron at the National MS Society suddenly died. Salk had many talents, but fundraising wasn’t one of them.Then, in the 1980s, Salk played a major role in research on AIDS. Early on, he took upon himself to negotiate a compromise between the French and American doctors who both claimed to have first identified HIV. It took two years but finally he succeeded, making possible collaborations that might well otherwise have been out of the question. Then he turned his attention to the development of a vaccine against HIV. Once again, his work was bitterly criticized — because he insisted on taking an unconventional approach. The prevailing wisdom was that a vaccine could only be developed on the basis of one portion of the HIV molecule; Salk insisted on using the whole molecule, which subjected him to ridicule for having ignored recent advances in medical research. However, he was proven right again. Initial trials of his vaccine showed promise and those developed by his critics utterly failed, but the criticism didn’t stop. It never stopped. (No successful AIDS vaccine has ever been developed, despite many promising starts. Research has focused largely on treatment to slow or prevent the progression of the disease.) Sabin continued to bad-mouth Salk at every opportunity — at scientific conferences, in science journals, and in Congressional testimony — until the end of his life. Salk’s forbearance, and his refusal to answer Sabin in kind, was legendary.Founding the Salk InstituteHe didn’t want to name it after himself. The scientific research center he founded in La Jolla, California, in 1960, came to be named the Salk Institute only because the principal fundraiser insisted that he could only raise the necessary money if Salk’s name were attached. In fact, throughout his life, Salk was generally soft-spoken, self-effacing, and unpretentious. He was horrified that the polio vaccine he developed came to be known popularly as the “Salk vaccine.” Whenever possible, he shunned publicity; unfortunately, that was rarely possible.Salk was, in a word, a nice guy. Expecting him to be cold and uncaring, his teachers in medical school and, later, in his residency discovered that he was solicitous and sensitive in his dealings with patients. And he almost never replied in kind to any of the criticism directed toward him in the scientific community. However, his personal life was marred in several ways: his single-minded devotion to his work caused him to neglect his wife and three sons, and, later in life, before and during his second marriage, he appears to have had numerous affairs.About the authorCharlotte DeCroes Jacobs, M.D., is an Emerita Professor of Medicine at Stanford. There, she engaged in cancer research and served as Director of the Clinical Cancer Center. Jonas Salk is her second medical biography, following Henry Kaplan and the Story of Hodgkin’s Disease. An award-winner both for her work in medicine as well as her writing, Jacobs has also been honored for her acting and singing. "I want to create an epidemic of health." Salk to one of his many mistresses. I suppose one would say being a womanizer made him a terrible person. Surely saving countless millions of lives earns one cool points, no?About the first 100 pages covers the disaster of the Spanish Flu that killed more in 1918 than WWI world over. That would be a bit over 20 million dead. I grew up in Boston and I did not know that for Americans the 1918 flu that killed so many 1,000s started on Ft. Devens. Thanks to guys like Salk few today live in continual fear of the flu season killing so many every year. Lessons learned in developing a vaccine here would help Salk in the next fight. The next section covered Salk building his lab that he had intended to use for continuing research against the flu when he got dragged into the Polio vaccine project. After covering the polio vaccine much of the next couple 100 pages go into great detail about Salk's efforts to create the Salk Institute For Biological Studies. Simply impossible to calculate how many lives have been saved or improved because of this hero. I only give it a 4 instead of a solid 5 because Jacobs is long winded. For myself I read every word because I'm a huge fan of Salk. A good friend of mine was crippled from polio in the 1930s and never walked again after age 12. His description of the iron lung terrified me as a child. So I'm well aware of what Salk saved so many of us from. A must read. This is an exhaustive, illuminating, and thoroughly well balanced life of Jonas Salk. He was animated from childhood by the idea of ma'asim tevim - doing good deeds - of which one is tikkun olam - repairing the world. And he succeeded. The polio vaccine he developed and which was released in 1955 changed the world. Even through years of debate and disappointment, by the 1990's his modified vaccine was accepted by the U.S. government as the preferred method of prevention. His curiosity kept him involved in searching for similar breakthroughs, from flu to AIDS, and he remained indefatigable to the end. Although there is lots of science contained in the book, the author presents it in a way that is mostly understandable and intelligible to the lay person.This is not to say that he was without flaws; he was. His first marriage collapsed; to the evidence he was not a warm father; he had affairs; he was alienated from the larger scientific community for alleged self-promotion.I highly recommend this, but I must add a small caveat. The author, Dr. Charlotte Jacobs, was my wife's primary oncologist for two years and I have an enormous bias for her intelligence and humanity. Jonas Salk: A Life by Charlotte DeCroes Jacobs is a very detailed and exhaustively researched biography of both the man and his work. For a scientist who arguably made the most important discovery of the 20th century in healthcare his life was not simply a tale of greatness and its many rewards. In fact, Jacobs does a phenomenal job through her consistently engaging writing of making Salk's uneven life trajectory into a smooth read.There is something for most everyone in this biography. There is enough science in the discussion of his work to engage those with a strong interest in science yet not so much that this becomes bogged down. For lovers of biographies in general this is a well written and well structured work that could easily be a measuring stick not just for biographies of Salk but biographies as a whole.Reviewed from an ARC made available by the publisher via NetGalley. It never occurred to me that there might be controversy to curing polio. How little do I know! I am really glad I was guided to this book where I learned a lot about polio's impact, the March of Dimes, the inner workings of the science academic community, and public & private life of another American legend. I admire and can relate to Dr. Salk's vision, passion, and energy. I may not be a scientist or physician, but the idea that science (or technology) must have a real-world application is rarely easy to make a reality. In Jonas Salk, we see how it is done, and there is so much more to his inspiring life. A very comprehensive book on Jonas Salk and the discovery of vaccine. Plus all the details on research and academia nightmares, first authorship, fame, humility, competitiveness, affect on personal and family life, intrinsic motivation and conflicts related to adherence to rigours of research while running against the clock as kids are constantly dying of the disease.Unfortunately this book is too long and too comprehensive for me. The audio book is 20 hours long (most fiction is about 10-12 hours). I have to stop. A well-written biography of Jonas Salk, best remembered for developing the first polio vaccine. The fame following that announcement changed the lives of his family members forever, and affected the course of his subsequent scientific career. While fame empowers some, in many ways it poisoned his relationships with other biologists, facts not known to me prior to reading this account. This was really informative. I understand she has also written a biography of Hodgkin and I look forward to reading that. Dr. Jonas Salk never showed temper---for a truly passionate and empathetic scientist in his field---this required much restraint. His 1957 Polio vaccine in America was a breakthrough and it saved on the cost of needles, syringes and personnel. “The marriage of science and art yields eloquent dividends and contributes gracefully "to the plan of the cosmos and to the laws of nature." Jonas Salk. Though he was an “outcast” in Medical Community (usually the case with genius) he achieved his goal.It was quite easy to hate a virology virtuoso; on my part there is no hate just sincere reverence for a man who prevented the death of thousands of children, men and women with his vaccine. Dr. Jonas Salk was a remarkable man. Found this book to be ideally suited for medical students, colleagues and those hungry for a dose of virology. Engaging read and must buy on my list. A marvelous book and an outstanding author, produces a wonderful book experience! The author is so very, very knowledgeable. I learned about this book from the Los Angles Times Book Festival and from listening to CSPAN, where the author, Charlotte D. Jacobs, was on a panel of biographers discussing her new book, Jonas Salk, A Life, published in 2015. Jacobs is an Oncologist who taught at Stanford. In interviews, she seems to have an inner beauty and a beautiful smile, and unending knowledge. The story of Jonas Salk is intriguing and amazing! Jacob's nine years of research and writing which went into this book prove to be incredible. This biography is a treasured story about a great man! Please read it! Salk had an eye for women; using his rambling and verbose thoughts on biophilosophy as seduction tool, illustrated by his favourite pick-up line:“I’ve been waiting for you my whole life. No one has been able to understand the breadth of my thinking.”No wonder the high caliber scientists at the Salk institute tended to make fun of him, some even called him the prophet.Once Salk asked a woman to help write his next book, The Millennium of the Mind. When she met Francis Crick and described her job, he replied, “I get it. Jonas needs someone to interpret his polysyllabic sentences.”At the same time he was a master in translational research. I got bogged down in the details of the experiments sometimes. Without an interest in the scientific method this book would be a tough read. With a really strong interest, I'd imagine it'd be a great read. I fall somewhere in between. A sympathetic and insightful portrait that acts as a good balance to Ochinsky's "Polio: An American Story", which was also excellent but a bit anti-Salk. Unfortunately for biographers, Salk's post-vaccine life is a long story of professional drift and marginalization, and though Jacobs chronicles these four decades with wit and charm, there just wasn't as much to interest a casual reader like me. But Jacobs' prose and research are consistently excellent, and it's hard to imagine Salk will ever get a better biography than this one. A well-done biography. I've long been an admirer of Jonas Salk. My admiration continues, but now, after having read this fine account of his life, I have a much clearer picture of a human figure rather than a textbook image of an American hero. I have new understanding of the character of the man, the nature of his work, and the idiosyncrasies of the scientific research community. I loved the first part and totally worth reading just for that. The history of Polio is a bit before my memory - though I have the scar to prove that I was pre-sugar cube era. It was an excellent follow up to Lab Girl and the drama and trauma researchers go through. I did listen to it - reader was excellent. Excellent ! Jonas Salk has long been my hero, because as a child I was terrified by the thought of getting Polio and having to be in an Iron Lung. I didn't know that he was also involved in the development of the Influenza vaccine and HIV/AIDS research. This author did a very nice job in bringing Jonas Salk alive. The first half of this VERY long book was interesting in that it told the story of the polio vaccine. I am choosing to abandon this book now because of lack of interest in the remainder of the mundane details regarding the life of the main characters. Impressive biography, respectful of Salk's uncommon intellect and inclusive of his human defects. Salk's life and work is thoroughly covered. Charlotte DeCroes Jacobs - Charlotte D. Jacobs, M.D. is the Ben and A. Jess Shenson Professor of Medicine (Emerita) at Stanford University. She graduated from the University of Rochester and studied medicine at Washington University in St. Louis.